Combat, exploration and role playing – the trifecta of any table top game. I was recently at a local hobby store and over heard something that made me chuckle. Player A was arguing with player B that 4E DnD was so combat heavy it left no room for role playing. Now I will agree that 4E has a very robust combat system which if not controlled will slow a game session to a halt. The combat round woes are exacerbated by the number of players seated around the table as well. But in truth the former is generally a challenge no matter what rule set is being utilized. The argument that role playing is a game mechanic is absolutely ridiculous to me. Maybe I’m just old school – but the art of role playing has nothing to do with rules or dice. Rather it’s the portrayal of a character and interaction with other PCs, NPCs and the environment created by the DM. I have run sessions where role playing was the main focus of the game. 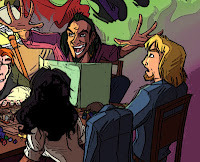 I think the lack of free form in 4E is the lurking problem. In older editions of the game when there was less rules players described their actions through role playing. Players were very encouraged to attempt cinematic tasks which there were no rules for. Set the rules aside once in a while! Most old school DM’s would make the story unfold without cracking open a rule book. Sounds cool, eh? In my campaigns I try to adhere to the rules for combat and prefer to then shoot from the hip with all other actions and requests. 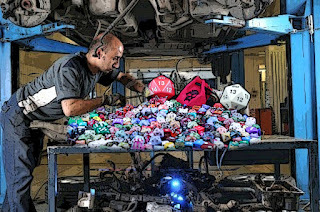 Sure I may throw out a random DC for a player to roll – after all DnD is a game and players like to use their dice. But overall I remain totally against being bogged down with rules minutia when it will negatively affect the flow of the game or worse the story. Role playing and exploring should not be impeded by the fickle fate of dice or the hamstring of rules. Everything in moderation should be the mantra for veteran and fledgling DM’s alike. So the next time someone complains that ANY game system is lacking in the role play department please join me in the chuckle. Role playing is not a game mechanic – no rules are required to do it. However game mechanics can be used creatively to help a player achieve their role playing goals. The late Gary Gygax once said, “A DM only rolls the dice because of the noise they make”. Take that to heart fellow DM’s and help your players drive high octane game sessions. Depending on the make and model of your group mileage may vary! Some of my best GMing has been quietly sitting there and letting my players talk IC. the setting had a pretty brutal combat system, and I think that helped keep them from needlessly charging into a fight, but on the whole, they just wanted to spend the time role playing.